Terry Ananny was born in Toronto, Canada in 1956. She had shown an interest in painting from an early age, and while studying art in high school, Terry still considers herself to be primarily self-taught. Some of her earliest & fondest memories are of her trips to visit relatives in rural Quebec. It is clear that the rich beauty and splendour of the colourful Quebecois villages were indelibly etched in her mind, as she lovingly recaptures the landscapes and the charming, upbeat mood of its people. There are two major elements in all of Terry Ananny’s paintings. The first things one notices are the bold and vivid colours. 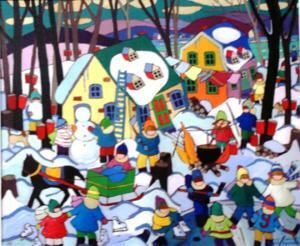 Then one is drawn by the almost magical, nostalgic scenes of old Canadian villages and of children playing in their surroundings. 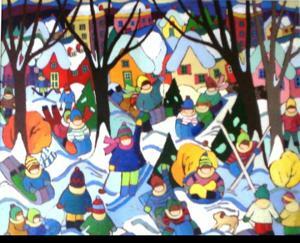 One cannot help but smile when admiring one of these paintings whether it be a winter or summer scene. Terry has pursued her artistic career full time for several years. She has participated in numerous exhibitions and had collected a number of awards. 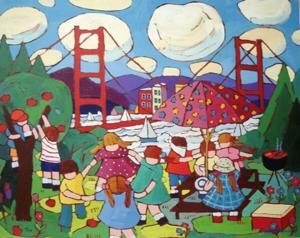 Her works are held in a number of Canadian and international corporate collections. 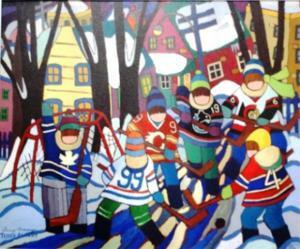 Terry’s work was used by Canada Save the Children, and can been seen on UNICEF cards, Christmas cards, and has been submitted for a Canada Post stamp. Her work is also collected by Prime Minister & Mrs Jean Chretien, the Canadian Embassy in Belgium, Merril Lynch Canada, Delta Hotels, and the Canadian Medical Association. Just to name a few.